The Dell XPS 15 9560 is a well-designed, solid performing, business oriented laptop with decent battery life. 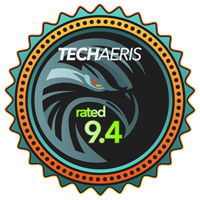 We’re not strangers to the Dell XPS laptop lineup here at Techaeris and have usually come away impressed. Our Dell XPS 15 review takes a look at the larger touchscreen version of the popular lineup with some pretty decent upgrades for 2017. 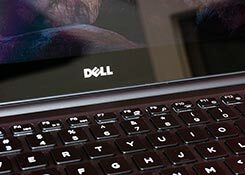 The XPS laptop series hasn’t changed much over the past couple years and the Dell XPS 15 is no different. With a CNC machined aluminum frame, the XPS 15 feels solid and has a premium look to it. 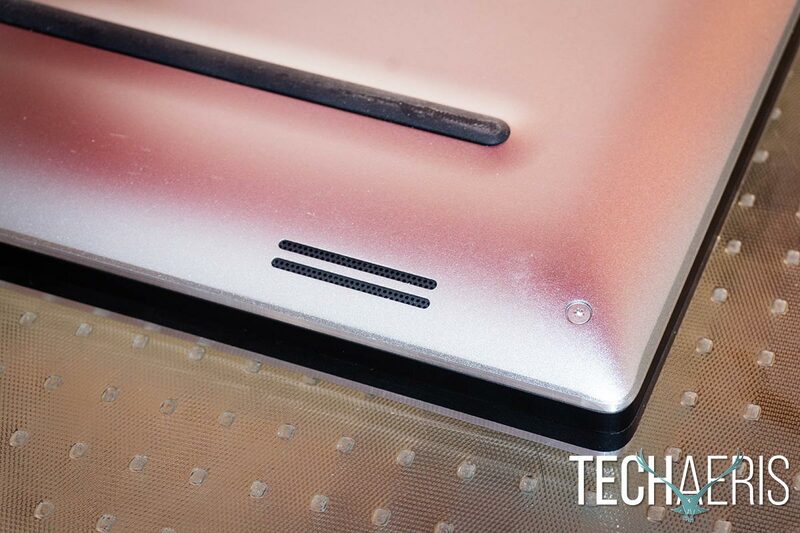 The lid on our review unit had a brushed silver finish, with the Dell logo embossed in the middle. The Dell XPS 15 has a sleek design and build quality (note: red tint is due to lighting conditions). Opening the lid, one is greeted with the familiar sleek looking carbon fiber composite palm rest. The surface is finished off with a soft touch paint which makes for a very nice surface for your hands. The keyboard is the same backlit keyboard found on the XPS 13 models and is still decent for extended typing with its low travel. As I’ve mentioned before, I’m not one for touchpads but when using the one on the XPS 15, it was pretty responsive and very smooth to the touch. The Dell XPS 15 keyboard has low travel keys. The InfinityEdge Corning Gorilla Glass NBT display is very nice as well, and the thin bezels really add to the sleek look of the laptop. 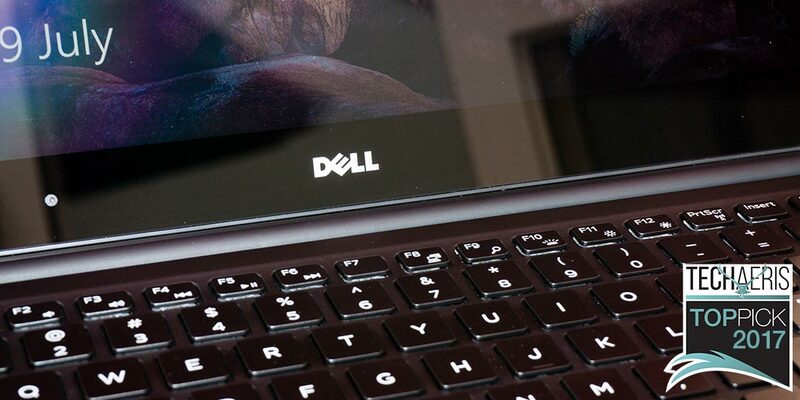 Because the top and side bezels are fairly thin, the webcam is located on the bottom of the screen to the left of the centered Dell logo. On the left side of the laptop, you’ll find the AC power port, USB 3.0 with PowerShare, HDMI, Thunderbolt 3 ports, and headset jack. The right side houses the Kensington lock slot, battery gauge button and indicator (a row of 5 LED lights which light up when you press the button), the second USB 3.0 with PowerShare port, and SD card slot. 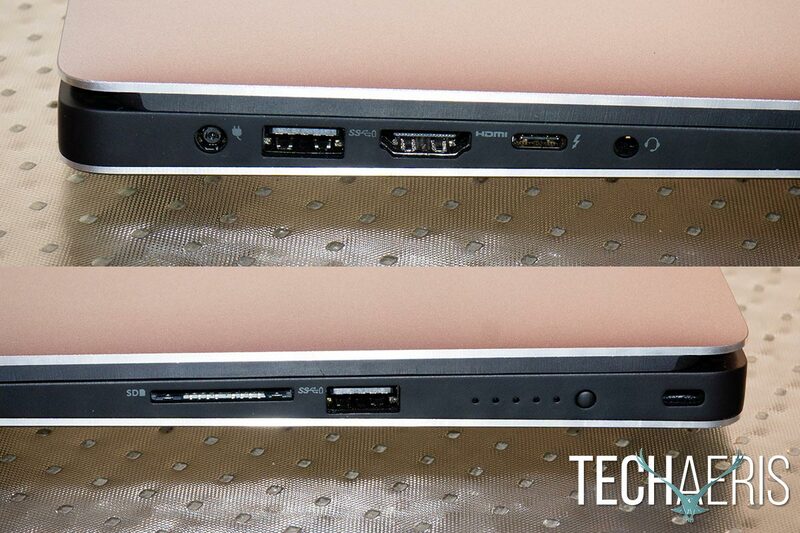 The left side (top) and right side ports on the Dell XPS 15. Finally, flipping the laptop over you’ll see the two speakers near the front on each side, two long rubber feet, and a row of ventilation slots for the fans. As mentioned above, not much has changed with the design of the XPS 15 laptops in the past couple years and the premium design and construction is still holding strong. 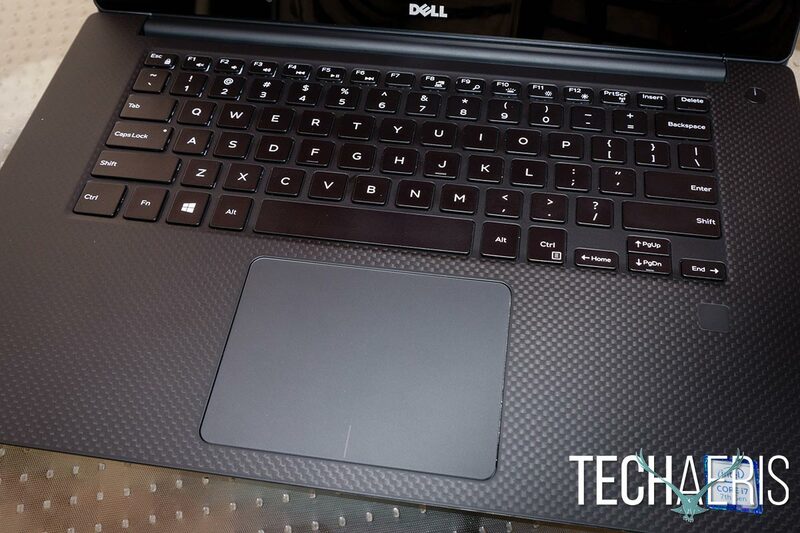 The top and edge bezels are only 5.7mm thick, allowing Dell to stuff a 15.6″ display into a smaller laptop. I remember being impressed with the Quad HD+ screen on the XPS 13 I last reviewed, but the 4K Ultra HD resolution on the XPS 15 really can’t be beaten. My daily laptop is a 17″ with an FHD resolution which works well enough, but when you use a 4K screen you really notice the difference. Being a touchscreen, there is some glare depending on your lighting conditions, but the UltraSharp Quad HD+ resolution is very crisp and clear, and the brightness can be adjusted for easy viewing in most lighting scenarios. I’ve felt in the past that higher resolutions on smaller screens were overkill but when you use a 13″ QHD+ and switch over to a 17″FHD laptop, the difference is night and day. The screen also has wide viewing angles, making it easy to see from various angles. Colors are rich and vibrant as well. While the 4K touchscreen is fabulous, there can be some glare in certain lighting conditions. The touchscreen is responsive as well and I once again enjoyed the combination of touch and mouse controls for navigating and using Windows 10. 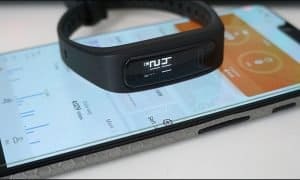 Being a touchscreen, however, the screen is quite glossy and depending on your surroundings, it may be a bit difficult to see at times. While I was able to use the laptop in direct sunlight, the brightness had to be turned all the way up and it was still a bit difficult to see some parts of the screen easily. For the most part, though, there were no issues caused by any extra glare or reflection on the screen. 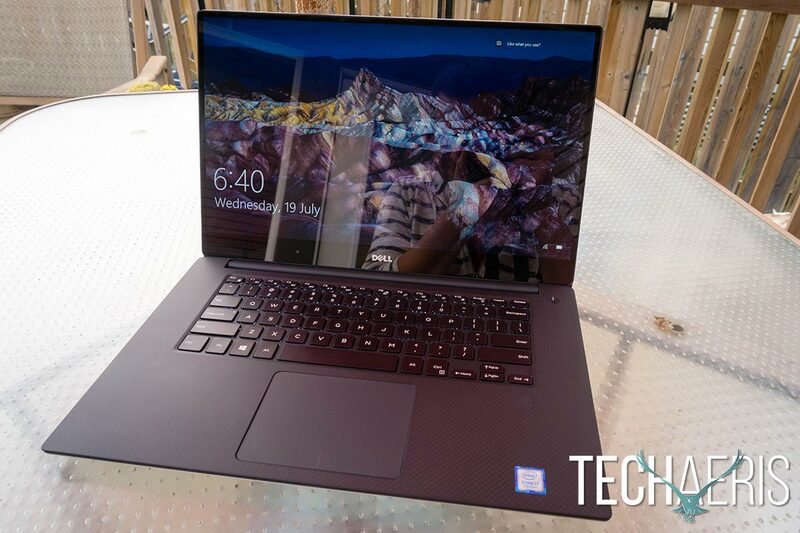 The Dell XPS 15 shipped with Windows 10 Home 64-bit installed, and the OS works well with the touchscreen. As usual, there are a few pre-installed apps that users just can’t seem to escape. The usual culprits include Office 2016 trial, McAfee, Adobe, and Dropbox. SupportAssist is also included to help automate support requests from Dell and also notifies you when there is an issue. As this model includes a fingerprint scanner, users can also take advantage of Windows Hello for easy login. The XPS 15 is, of course, compatible with all Dell Client Command Suite tools. The Dell XPS series targets the business crowd and performance of our review unit with the listed specs above easily handled the usual Microsoft Office applications and programs like Adobe Photoshop, Lightroom, and Premiere. About the only thing left to upgrade on this system is upgrading to 32GB of RAM from 16GB, but everything ran and rendered fine and quickly as is. You’ll be able to get by with some gaming for those down times, especially with the addition of the NVIDIA GeForce GTX 1050. While you won’t be VR-ready, you will be able to run most games with little issue and decent resolution and framerates including Heroes of the Storm and more GPU intensive games like Forza Horizon 3. In Heroes, running at 4K resolution with settings maxed to their highest levels, I was able to get between 55 and 67fps during gameplay. Forza Horizon 3, on the other hand, came in at a solid 28-30fps while running in 4K resolution on the low graphics setting. Even though it wasn’t set to high, the game still looked better than high settings on my 1080p laptop — especially the vehicle modelling. When tested at 1080p with ultra graphics settings, I was able to get between 35-48fps with the game averaging around 42fps. Games like Hearthstone, Microsoft Solitaire, and Microsoft Bingo still remain fun to kill some time with using the touchscreen. Again, laptop speakers are usually somewhat lacking, although the ones on the XPS series are surprisingly decent. Although they are lacking bass, which is to be somewhat expected, they were definitely decent for movies and video watching, as well as listening to music. They aren’t overly loud, and I found while watching videos I had the volume up between the 60-80% range. Unlike the XPS 13, the speakers on the XPS 15 are back underneath the front of the laptop and utilize your desk to bounce sound off of. The speakers are located on the bottom, allowing the sound to bounce off whatever surface you have the laptop placed on. As has been the case in the past, the widescreen 720p HD camera on the XPS 15 is decent enough for video calls and worked well in various lighting conditions during testing. 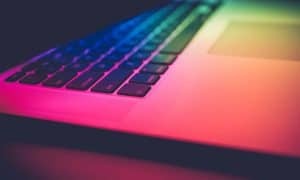 With a 15.6″ 4K touchscreen, i7 processor, and an NVIDIA video card, you’d think that battery life would be affected, and you wouldn’t be wrong. That being said, I was pretty impressed with the battery life of the XPS 15 during our testing and was able to consistently get between 5 and 6 hours on a single charge. Most of the time the brightness was set to around 75% with the occasional bump up to 100% depending on my surroundings. Typical tasks during battery testing included basic office tasks, web browsing, document editing, and other office related tasks. A few videos and some streaming music along with a few short gaming sessions (namely Hearthstone) rounded out the apps used while on battery. While its doubtful the XPS 15 as tested would get you through the entire day on a single charge, I was more than satisfied with the battery life it put out and there’s always the FHD version which would definitely last even longer before requiring a recharge. Starting at $999.99USD ($1,399.99CAD) for the i3 processor, FHD version, our review unit comes in around the $2,149.99 ($2,729.99CAD) mark. Drop the touchscreen and you’re sitting around $1,749.99 ($2,299.99CAD). For the full meal deal (touchscreen, i7 processor, 32GB RAM, 1TB SSD), you’re looking at around $2,624.99 ($3,229.99CAD). 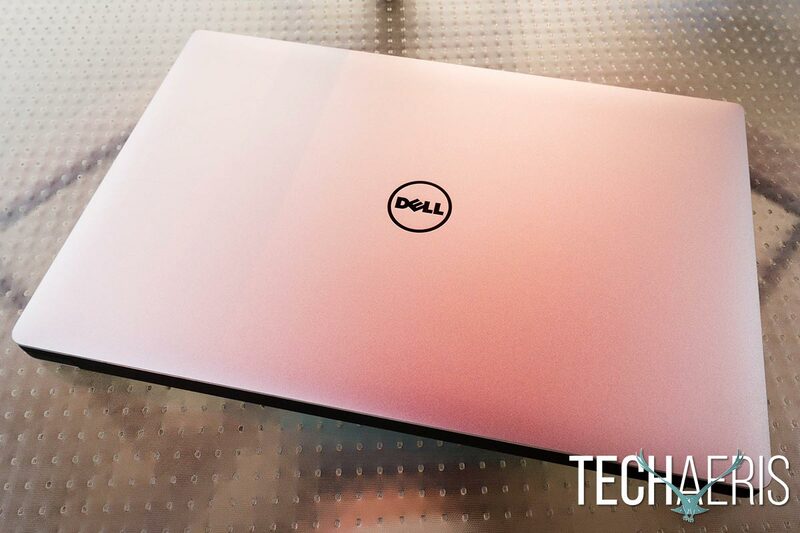 While that may seem expensive, it really is in line with what’s under the hood and there are plenty of options to customize the XPS 15 exactly how you want it or to bring it down to your price range. *We were sent a demo unit of the 2017 Dell XPS 15 9560 for the purposes of this review.